 *Editor's Note: InsideEVs has documented Peder Norby's journey since Day 1. This post is the month 8 update in a year-long series in which the Norby household attempts the near-impossible. 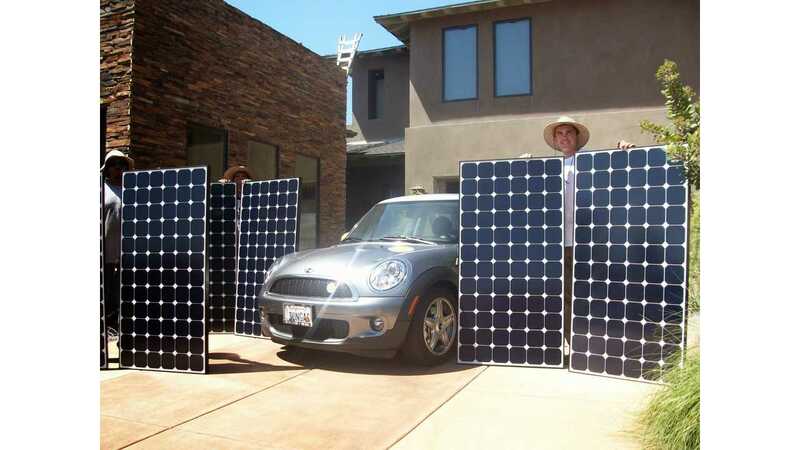 The basic idea is simple: Can we harvest endless sunshine from a small portion of a roof to provide 100% of the energy needed to power a home and two cars (a pair of BMW i3s) with zero utility cost, and zero gasoline cost for 12 months? Read on to find out. We're popping the first bottle of champagne as we have now documented a whole year with no cost of energy and no cost of gasoline to power a home and drive two EV's a collective 20,000 (actual 24,350) miles a year. How we use our BMW i3 Frunk. 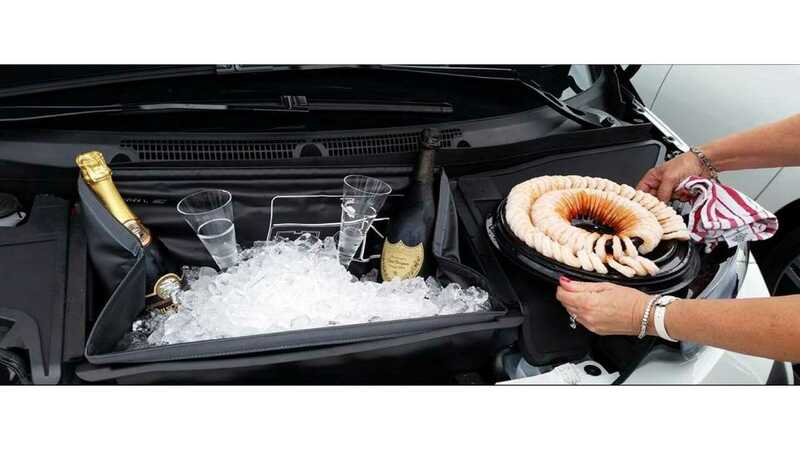 Champagne and Shrimp on ice! We're not done yet as we still have four months to go on our effort to get to Net Zero energy, as well as zero cost. More on that at the end of this post. Today, we affirmatively answer this question: Can we harvest endless sunshine from a small portion of a roof to provide 100% of the energy needed to power a home and two cars with zero utility cost, and zero gasoline cost for 12 months. It's possible that this feat has been accomplished before. We are not aware of any documented effort by any household in the world, where from a small portion of a roof, sunshine is harvested to provide 100% of the energy needed to power a home and two cars with zero utility cost and zero gasoline. We believe, we are unmistakably on a transitional path to renewable energy and electric transportation, a path as predictable and reliable as the sun rising from the east, racing though the heavens, and setting in the west. We are living at a time of one of the biggest changes in the history of humans on earth and we are all active participants in this evolutionary change towards renewables for energy and transportation. A change that brings with it; healthier air, cleaner water, richer families and communities, energy equity and a premium quality of life. Driving is faster, quicker, quieter, less jerky, more enjoyable, and yes, it puts a big fat grin on your face every time you do a 0-60, 6.5 second sprint in the BMW i3. Think about it for a second, the "future is today" whereby we can provide the energy for our cars and our homes by harvesting sunshine on our roof. Harvesting coastal breezes to cool our home, partnering with nature. 1. Building a very efficient home. Harvesting passive solar for heat, wind for cooling, rain for growing both drink and food. 2. 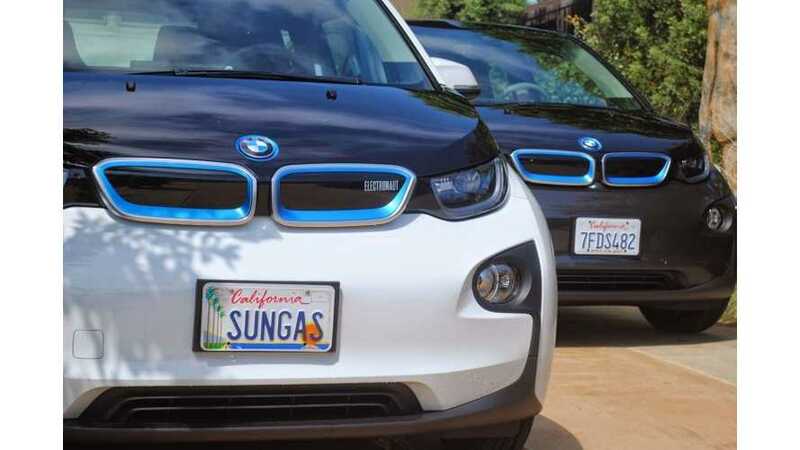 Our two BMW i3's, the most energy efficient car sold in the USA at 124 mpge. 3. Harvesting the sunshine falling on our rooftop to power our home and cars. 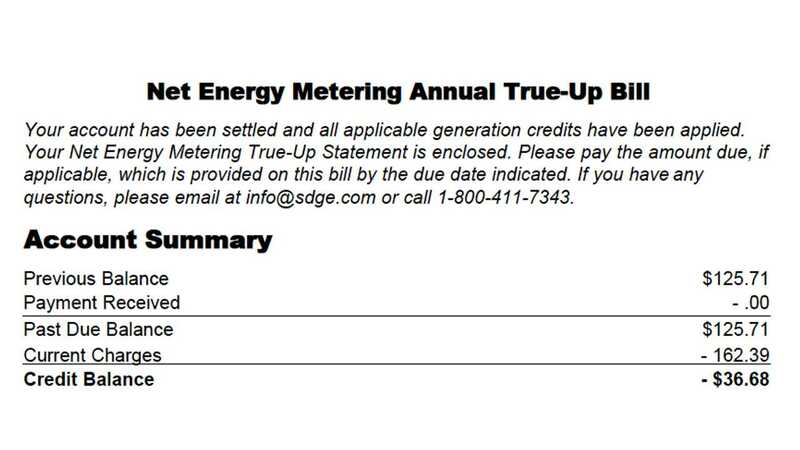 On January 19th 2015, we received our "Annual True-Up" bill from our utility, SDG&E. This bill will be common in many states in just a few short years. Highlights from our annual bill. Interesting Tidbits: We had anticipated getting to zero cost in May of 2015. However the efficiency of the BMW i3’s reduced our energy use far more than we thought, so we accomplished the goal five months early. For the first five months of the year, we were driving a BMW ActiveE EV and a Honda Fit EV. The i3's were delivered in late May. Our two BMW i3's use 6000 kWh of electricity annually, an average of 3000 kWh for 12,000 miles each, 24,350 mile total. We have had no gasoline cars during the year. Our home uses 7500 kWh per year. 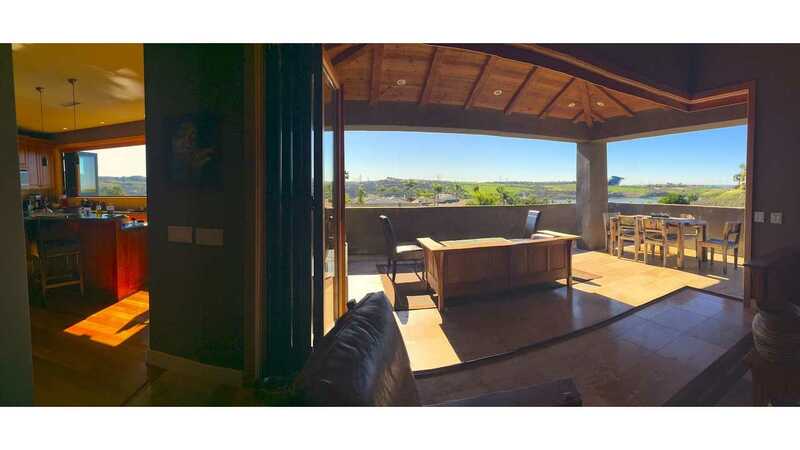 Our home consist of a main house of 3300 sq. ft. occupied by three, and a guest house of 1200 sq. ft. occupied by two. 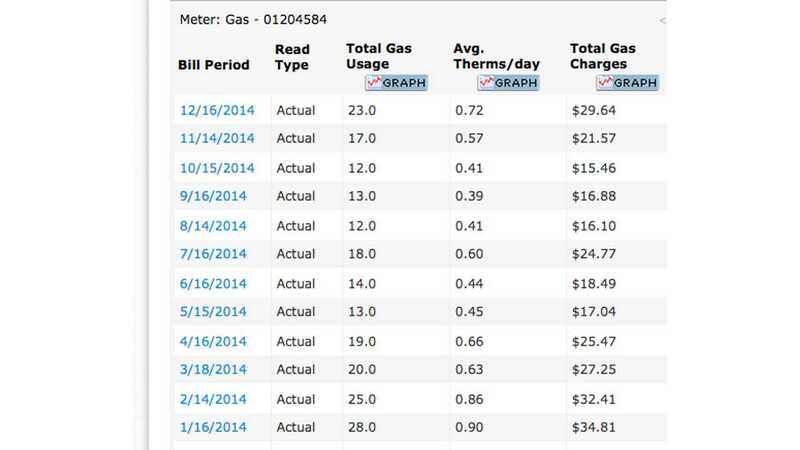 It's essentially two homes with two families on one utility meter. Our solar 8.5kw PV system, installed in 2007, was paid off in April of 2012 with the utility and gasoline avoidance savings. We have reduced our CO2 emissions by 30 tons annually. To have zero carbon footprint. We have reduced our household carbon footprint to 2 tons per year according the EPA carbon calculator; the remaining carbon is due mostly to our small natural gas use. The national average is 40 tons per household. To offset our generation of carbon, we have donated a brand new 9kw solar PV system to our local lagoon foundation. This solar PV system offsets approximately 13 tons of carbon a year. We are net carbon neutral. Four months to go, can we get to negative kWh? 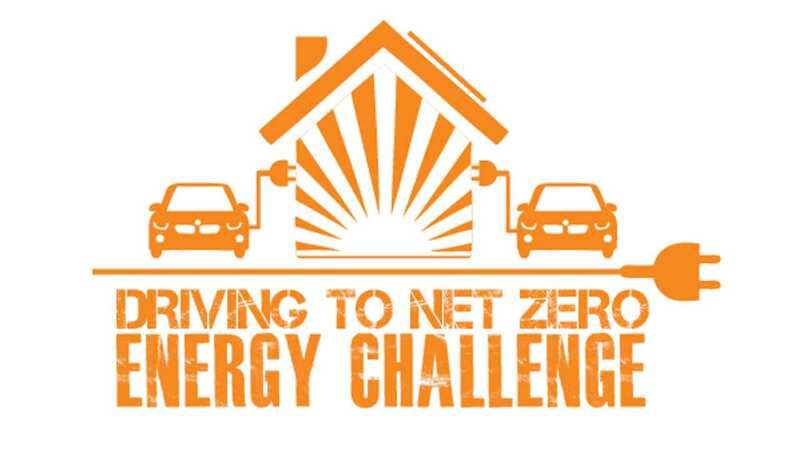 We began this "Drive to Net Zero" in May of 2015 with two goals. The first and largest one was to zero cost. The second and perhaps harder to attain, to be net zero energy. We have four more months to go, are we going to make it? It looks to be close. Next month we will add a couple of hundred more kWh to the total and then the following three months we will reduce the total. What makes this challenge interesting, is that it is real world with a real family, not some theoretical exercise, on some "super house" on a university campus with a non existent family, substituted with a computer tabulation of static energy use over a year, including one compliance car which you can no longer buy or lease. Life is not static, it's dynamic, wonderful and ever changing. In our case we have had a few unplanned for events over the past eight months that have added a few thousand kWh to our "normal living" usage. 1. We're hosting a 17 year old French Rotary exchange student for the year. You should see her hair! Anyone care to calculate how many kWh per year 20 minutes of blowdrying 7 days a week uses? Not to mention lights, computers TV and more. We love her and she is having a great experience in the USA. 2. It's my year as Chairman of the San Diego County Planning Commission. What was typically 3-4 long drives a month is this year 12-15 long drives a month as chair. 3. Family illness and the loss of a loved one. We said goodbye to a family member and another had a major surgery a month before. This created many many long trips to the hospital and to my siblings over the course of a few months. The family is strong and it was a blessing. Getting back to cars, the BMW i3 did great handling all the unexpected and longer trips and we made use of the DC fast chargers at Fashion Valley and downtown San Diego during this time. 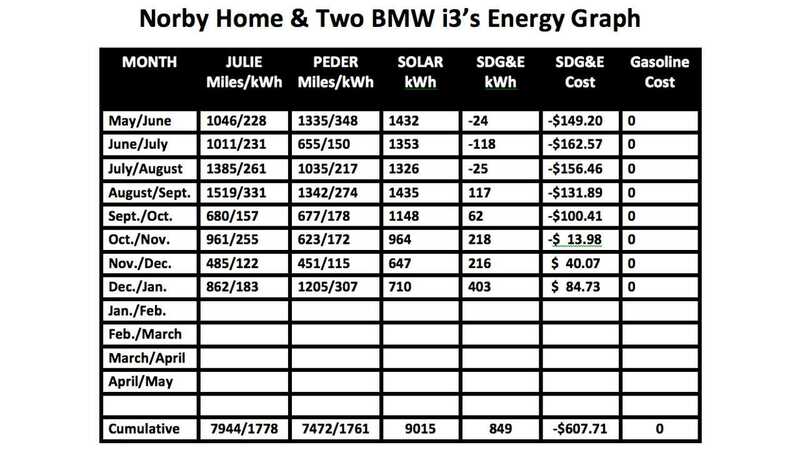 We are putting on about 5000 miles extra on our i3's over what we planned for and what is typical for us. 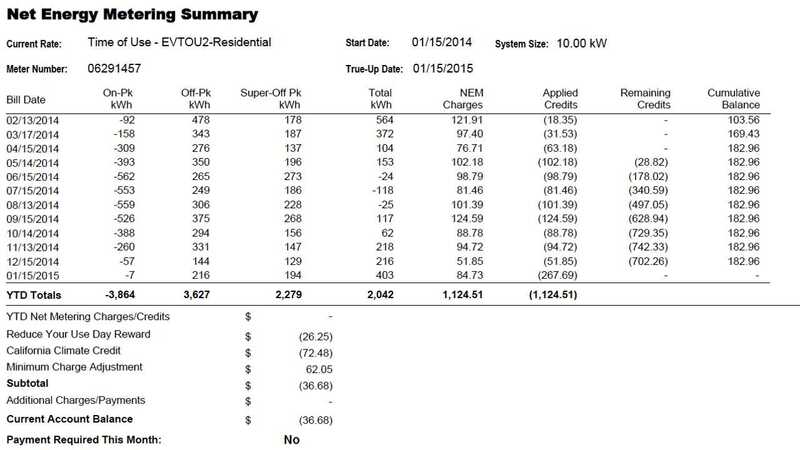 I think were going to be plus or minus around 500 kWh for the year. 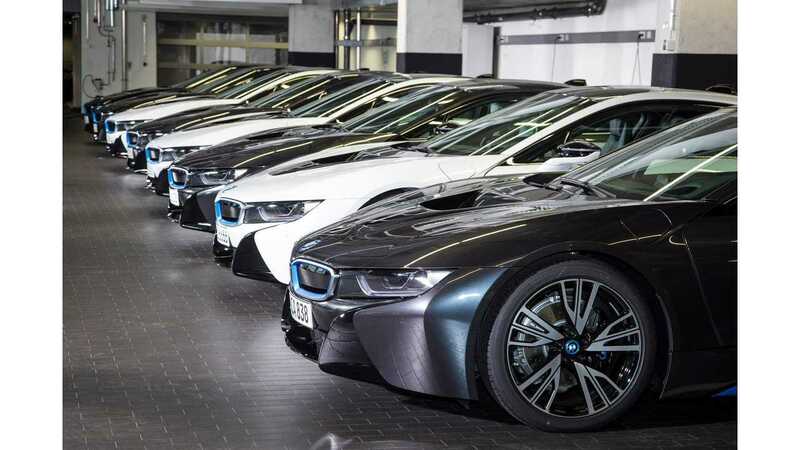 About that BMW i8... 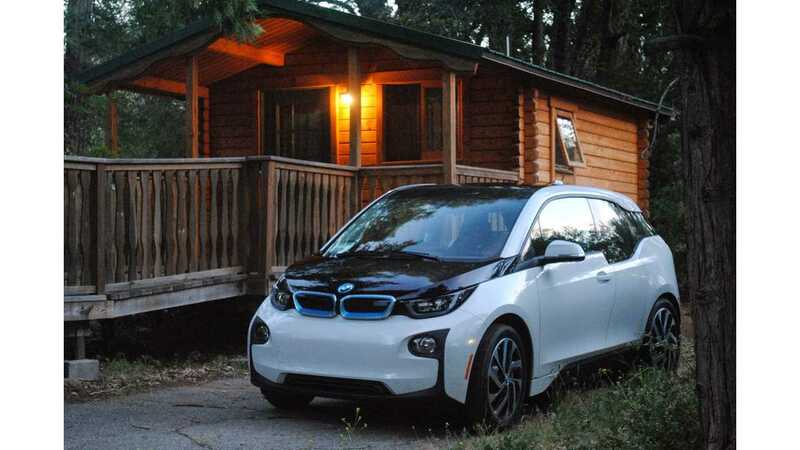 Owning a "First Vintage" of both the BMW i3 and the BMW i8, is a scrapbook of a personal journey of our several year relationship with BMW from the "Mini-E and a dream for the future," to today with both cars, a BMW i3 and BMW i8, a reality. Our plan is to keep the BMW i8 as a very low miles collectable car and we will keep both of the BMW i3's as our daily drivers. It's sort of our own version of a flexible mobility program. With two BMW i3's we would borrow or rent a long haul gasoline car once or twice a year for a trip to Napa, now we'll take the i8. It's also going to be a great out to dinner car driving electric only to our local restaurants. Sunshine is a transportation fuel.